With all the media coverage about police brutality against visible minorities within America, I felt comparing crime statistics with population statistics highlighting the number of visual minorities within each Toronto neighbourhood was relevant and insightful to juxtapose two sets of raw data for users to draw their own conclusions from. A goal of the project is to present data objectively to the audience to let viewers draw their own conclusions. It was also a challenge to present so many levels of data in a simple, easy to understand at first glance way. Prototyped using Processing and drawing data from Toronto Open Data, users can view, compare, and interact with raw data comparing and filtering down crime rate information to population statistics. Drill down into the data. As a whole, users can compare neighbourhoods to each other seeing the total raw numbers of population and crime. 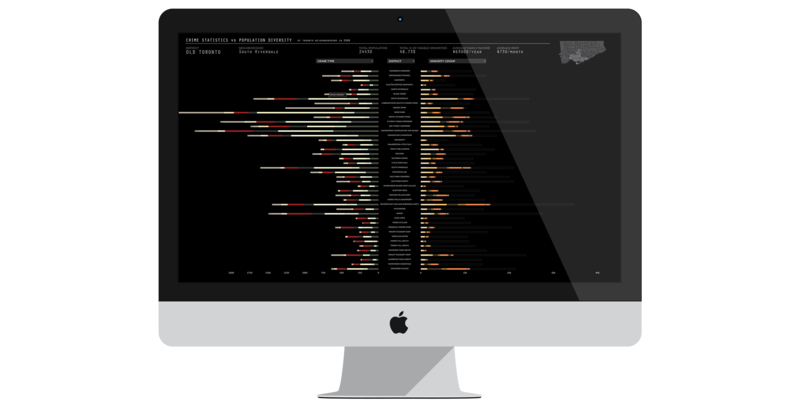 Drilling down further, this data visualization tool highlights the parts of the whole in both the crime and population data; types of crime in compared to the total number of crimes, and percentage of visible minorities compared to the entire population number. Comparing the two sets to each other provides another level of depth and lets users draw their own conclusions from data. Users filter through the districts of Toronto to find the neighbourhood that they might be curious about. The map thumbnail provides a representation of a location of where each neighbourhood is within Toronto as a whole. View additional insights on hover. Additional information about each neighbourhood is provided on hover. Some information is the same information that is shown on the graphs but in a different form of communication such as the numerical value of the population and the percentage of visible minorities within. Other additional information that is not communicated through the graphs includes the neighbourhood’s average family income and average rent costs. This give the users more of an insight to each community and brings focus to the individuality of each neighbourhood. I worked individually to build the concept, design the interface, and program the software in Processing.